Eucalyptus plantations have seldom responded to N fertilization in tropical and subtropical regions of Brazil. This implies that rates of N mineralization have been adequate to supply tree needs. However, subsequent crop rotations with low N fertilization may result in declining concentrations of organic and potentially mineralizable N (N0), and consequent loss of wood productivity. 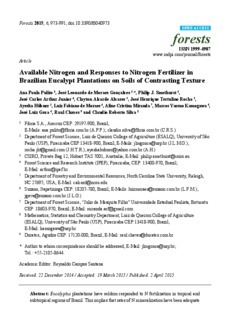 This study investigated (a) in situ N mineralization and N0 in soils of eucalypt plantations in São Paulo state, Brazil; (b) tree growth responses to N fertilizer applied 6-18 months after planting; and (c) the relationships between N0, other soil attributes and tree growth. We established eleven N fertilizer trials (maximum 240 kg ha−1 of N) in E. grandis and E. grandis x urophylla plantations. The soil types at most sites were Oxisols and Quartzipsamments, with a range of organic matter (18 to 55 g kg−1) and clay contents (8% to 67%) in the 0-20 cm layer. Concentrations of N0 were measured using anaerobic incubation on soil samples collected every three months (different seasons). The samples collected in spring and summer had N0 140-400 kg ha−1 (10%–19% total soil N), which were best correlated with soil texture and organic matter content. Rates of in situ net N mineralization (0-20 cm) ranged from 100 to 200 kg ha−1 year−1 and were not correlated with clay, total N, or N0. These high N mineralization rates resulted in a low response to N fertilizer application during the early ages of stand growth, which were highest on sandy soils. At the end of the crop rotation, the response to N fertilizer was negligible and non-significant at all sites.